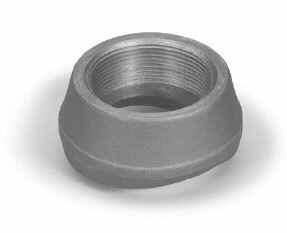 SA/105 & SA/A350 LF2 CL1 | WFI International, Inc.
Each outlet size listed is available to fit any run curvature. Threaded ends are in accordance with ANSI/ASME B1.20.1 Design per MSS-SP-97. Outlet sizes noted above fit a number of run pipe sizes, and the fittings are marked accordingly. Refer to our Consolidation Chart. A flat Threaded Pipet for use on welding caps, elliptical heads and flat surfaces is available. ORDERING When ordering a fitting, refer to our catalog under the product section. Although every attempt has been made to insure that the information contained in these tables is correct, WFI reserves the right to change the “B” and “C” dimensions as deemed necessary. 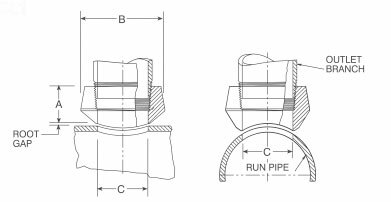 *The "C" dimension represents the waterway dimension of the fitting and does not include the minimal taper and radius required for manufacturing purposes. Installation holes in header should be based on actual fittings.